What would make you buy more Spyderco fixed blades? Re: What would make you buy more Spyderco fixed blades? When I pocket carry it makes it impossible to re-sheath quickly or one handed...gotta fish it out of the pocket, turn it the right way, then use both hands getting it back in there. Then how would you conceal it? Isn't that something you were going for? My BM Azeria works well clipped to a pocket fwiw. I took it off my belt and clipped it RFP the other day when we were dealing with a large shipment of supplies at work. The clip tension is a little stronger than a G clip. Yeah that's part of the problem...what makes it easier to carry makes it harder to conceal, and what makes it easier to sheath makes it stick out of my pocket. Then I come back around to the question of what am I gaining vs a folder and I don't have an answer. Have you ever tried horizontal belt carry? Conceals easily with an untucked shirt, accessible enough for easy one handed use. I like FB's because I never have to loctite pivots or clip screws, no moving parts to oil, the action doesn't get gritty because a little dirt got on the knife, they're worlds easier to keep clean...especially if you need to use them with dirty hands, more rugged which is nice when I'm camping or hiking, better for food prep, carrying a knife in a sheath makes corrosion resistance 99% less important for me since the blade isn't exposed to my battery acid sweat, the fully contoured round handle shapes are more comfortable, and I can get an awesome custom made to my specs for $50-100 which doesn't happen with folders. Lastly, with the right setup they're quicker and more convenient than a folder. Still to this day my favorite Spyderco fixed blade is my set of TEMPERANCE 1 models. I've been blessed with both the TEMP 1 in PE & SE both. With that said I would love to see more of Spyderco's great fixed blades offered in Spyderedge. The Southfork, Catcherman and STREETBEAT would all be in my footlocker if I could get them in Spyderedge. But for now I'll continue to use my original TEMPERANCE 1 models in SE & PE on a regular basis. I do hope at some point they would consider doing a Sprint Run of the TEMP 1 in LC200N in SE & PE. That would be a colossal addition to the Salt Series IMO. For me, it's about size and blade shape. The Ark is a near perfect size, but I find that I don't have as much use for a blade with that much belly in my day to day use. If it were a wharncilffe, I'd likely already have two in my collection. It also seems like most fixed blades that would be an optimal size for me are set up to be carried as neck knives, when I'd much rather be able to carry them on my belt. I also took off the spyder hole & hump so that there was somewhere I could put my thumb. Not sure where it's supposed to go on the original design. You can also see how I set it up for belt carry with some paracord loops. I was really excited when they released an H1 EDC sized FB, but it ended up not working out for me. Too much belly, the hump got in the way of my thumb, the sheath on mine doesn't lock (I can easily pull mine out without pressing the tab...even before mods), and the handle is so thin a side pinch grip is the only comfortable grip for extended cutting. I'm sure it's great for what it was designed for. I'd still like to see an H1 EDC that's a similar size, but wharnie, flat spine, and better sheath. They release something like that, and I'll buy two. The Reverse was close, but once I was at a point I could afford one, they had all disappeared. In short words: As long as fixed blades have the useless hole in it, I'm not interested. Spyderco insists on it and it is their good right. I love the Spydie hole.A knife-fixed or folder-without a hole in the blade would not be a Spyderco anymore. Do you use one? I don't think I've ever seen someone utilize that feature. I used to think having the hole on fixed blades was silly, but after thinking about it, I suppose it makes the knife lighter. It's certainly never gotten in the way for me. I never have, and not much need on a small knife. A camp chopper, I would use one. Agree! If it is H1 it should be SE though, otherwise a different steel for PE (lc200N ?). I did get a Reverse and I really like it, but another I would prefer with a steel upgrade (IMO). I use the majority of my fixed blades for bushcraft and general camp use. Whether it's a smaller knife for carving or a larger knife for chopping, I prefer tool steels like O1 and 3V. I also prefer Micarta handle scales. I probably would have been more interested in the Temperance 2 and the Schempp Rock Salt were they offered in different materials. For hunter knives, I like stainless steel with G10 or Micarta scales. The South Fork was a pretty sweet looking blade, but admittedly I don't do as much hunting as I used to. I also have a penchant for martial blades. I would love to see the Street Bowie in a satin finish with black Micarta scales...and a more premium stainless steel. I love and use Spyderco folders on a daily basis, that said I have yet to pull the trigger on any of their fixed blades. Sadly, while I always find a folder from Spyderco for the next purchase, I have yet to find one of their offerings in fixed blades to be a winning choice. My last two fixed blade purchases were a Bradford Guardian 3 and a Lionsteel M1, both in M390 steel. I looked at the street beat, and it is a bit cheaper, but for the few extra bucks I got a premium steel, a nice leather sheath, and the option to interchange handle scales. VG10 is no slouch and I love the ease of sharpening, but I wanted something a bit more premium. That said, the Waterway and Province are both on my radar. When they are finally out in the wild, I may buy one or both. I'm with you guys on Micarta. I like FRN for folders. It can be molded into a contoured shape, it's economical, very light and as tough as I need a folding knife handle to be. But on a fixed blade I'll take micarta over FRN any chance I get. It feels much better, and looks great. That's the biggest hurdle I've got, I have to tuck my shirt in for work so this only works on my off days. I even talked with Dr Snubnose a while back about ideas and that alone is a big hurdle when trying to conceal anything. Pocket sheaths are pretty much my only option for work. David, how about a Spyderco knife that can cut through coax cable with no damage to the blade edge? Good idea? I’m a big fan of Spyderco fixed blades. I’ll most likely buy a few of them no matter what. I think I have just as many Spyderco fixed blades as I do their folders. Guess I’m one of the odd ones. I loved the original Temperance and have enjoyed making handles for my mule blades. Very unique and creative place to buy blades. Surely a very small market ? They desihn a blade that cuts coax, what about stripping it which is a PITA with a blade. We seem to want some great new products and sprint runs, doesn't this type of thing dilute limited resources away from what the majority want ? I have several non-Spyderco fixed blades. Of those, only one really gets used - camping and such. Even worse, ever since I got the Military and Police, the usage is lower yet. For my needs, an additional fixed blade is pretty low on the list. It just wouldn't get much use. Just for fun, I went over the Spyderco fixed blade catalog. Of the ones available, the Bradley Bowie would be the one if I was shopping. Size, weight, sheath, all fit what I would want out of a new/replacement fixed blade. It is a beautiful knife. But, I can't justify the price. Wouldn't be used enough, and almost too nice for how I use a fixed blade. I guess I just don't need more fixed blades, Spyderco or other. 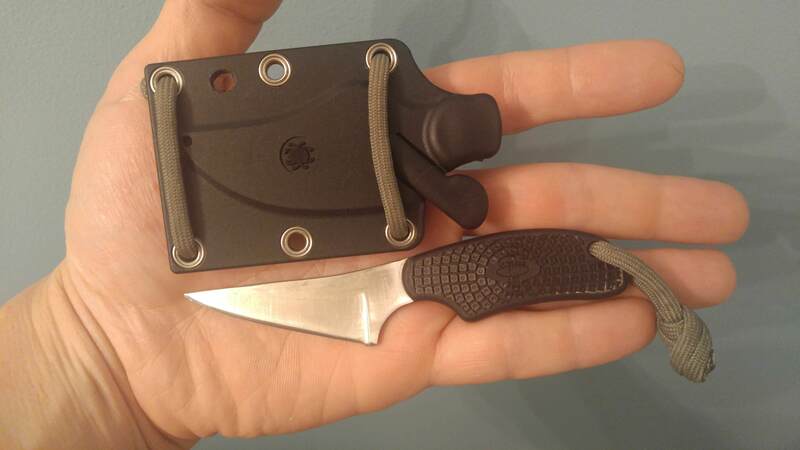 I would like to see more small, edc sized fixed blades. The Swick was a great design and one that I enjoy carrying now and again. The Mule pattern is my day to day FB carru though. I have been modding the handles on my mules little by little to make them even more compact without compromising a full 3 finger grip. The blade will be the next project. Back on topic, I would be more interested in FB Spydies if the grinds were thinner, the steels continued to be the options we see in the folders and finally, the sheaths have a more minimal (compact) shape. I tend to enjoy folded over sheath designs with a seam on only one side (usually the edge). The lack of flange all the way around the knife makes them much more appealing and functional for me. Edit: IIRC the Temperance I did not employ a Spydiehole. sal wrote: .... even today, we design a knife from the edge out! Having a convenient way to carry and conceal them would help. I keep thinking that the right pocket sheath could solve this problem for me but ultimately it comes down to the question of what exactly am I gaining vs my folders? We all know the answers but honestly none of them really sway me enough to completely pull me over from the folder side. That's a most interesting observation. I too have had concerns about "concealment and storage". My late best friend who EDCed a Streetbeat had got an ankle sheath which he swore by. That might end up being an option for me as well. I like fixed blades and I like Spyderco's broad selection of them. I wish more of the older/better models would return but I'm always on the lookout. A lot of the guys here have said they didn't like the "BLADE-TECH" sheaths like the ones they used on the TEMPERANCE 1 models but I've had nothing but great results using them. Could be a "Ford vs Chevy" argument. I do wish that they would check into more options on types of sheath, methods of carry and different designs. I'm still waiting for a fixed blade Hawkbill. For me, it would take smaller fixed blades with a sheath that would fit in my pocket. It would be nice if the sheath had enough retention in my pocket that when I draw the knife, the sheath stays securely in my pocket. Make it small and a useful edc blade shape and I’m in. 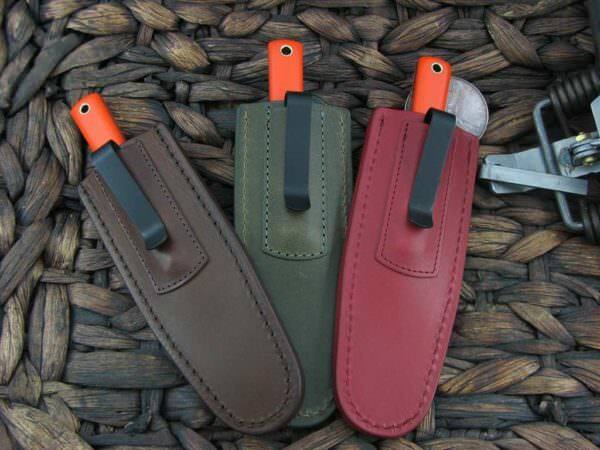 What do you guys think about a sheath like this? With a more discreet handle color, slightly deeper carry, and maybe adding a lanyard, it sounds like it may work for pocket carry the way you're envisioning. Is that an inside the waistband sheath? They look fine in the current colors. My current favorite sheath is Armatus Architect Sheath in Black Carbon Kydex for a Guardian 3 and 4. You can mount the knife any way that you choose. Spyderco Collection: Military S110V, Bob Lum Darn Dao, Yojimbo 2 (ONE) S30V & (TWO) CF 20CV, Sustain, Native 5 Maxamet, Jumpmaster 2. SHORT LIST: CF Shaman in S90V; Manix 2 Maxamet; Native 5 Fluted CF in S90V; Nirvana in S90V; Proficient S90V; Para 3 in M390; Street Beat in VG-10.